There's really not much new to say on Dawn of the Dead's poignant, prescient, almost prophetic narrative commentary on modern consumerism. George A. Romero's satire on our zombie-like trance when lured towards the shopping mall is one of its great strengths as a piece of cinema, but, of course, it's been studied and discussed to death. I can't add anything new that you haven't already heard. But I do love its still-relevant social satire. The make-up effects tend to divide opinion these days. Pioneered by Tom Savini with a modest budget but sky-high imagination, many have stated that the FX work has badly dated and looks ropey these days. The grey greasepaint makes the zombies look "like smurfs" under certain lighting and the red blood looks like "spilled paint". It's easy to say these things when it's been copied and improved-upon over four decades, and equally easy to forget just how shocking and groundbreaking this stuff was back in 1978. It's also easy to forget that Savini had very little in the way of a special effects "industry" to fall back on. 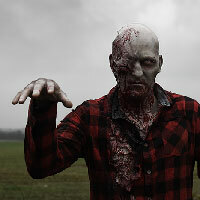 Today, if you need a cool zombie prosthetic, just head to the internet and one will be on a next-day courier. Savini had nothing like this. He had to invent, fabricate, innovate, and craft his way through this whole production. This was state-of-the-art back then, and it still works pretty well today. In fact the zombies are some of the best in any film of this type. How so? Think about modern zombie movies, such as World War Z, or the Walking Dead TV show. Think about their zombies. They are all beautifully sculpted, painted, designed pieces of shuffling craftsmanship. Teeth protruding over lipless mandibles, leathery skin hugging broken cheek bones, eyeballs hanging out of sockets, intricate wounds festering and weeping, bloody, veiny contacts in the eyes. Even the clothing is sliced, diced, stained and rotten to create a whole piece that is designed to look great on camera. Zombies look incredibly cool these days. While this is an inevitable state of their evolution in the entertainment media, as more artists try to create more memorable and exciting zombies, the one issue that arises from this is that they have become very much pieces of design. In fact many of them slip so far into the realm of exhibiting fantastic design and craftsmanship, that they lose something of their everyday mundane humanity. There is a sense in Dawn of the Dead that the zombie extras were asked to just turn up with some old clothes. The result is a mis-matched hotchpotch of randomness; a distinct lack of design. What you have is very close to reality. With a few notable exceptions where Savini allowed himself some indulgence with the design (such as the airport zombie), most of the zombies in Dawn of the Dead are just normal, everyday folk the likes of which we all know. They feel like "people" rather than "monsters" and that's important. After all, they are us and we are them. The layer of heavy design in modern zombie entertainment separates them from us a bit too much. Between them, Romero and Savini created zombies that are uncomfortably close to us. To be honest, there isn't much I don't like about Dawn of the Dead. I love the performances of the cast, I love the zombies, I love the location, I love the gore, and of course I love the music - both the library tunes and the amazing tracks supplied by Goblin. It was inevitable that I would one day do this tribute shoot. After all, Dawn of the Dead was instrumental in shaping my young brain towards horror, as I discovered it so young. I was lucky enough to have a dodgy old copy on Betamax as a kid and it was watched and re-watched far too much to be healthy. Doing this tribute shoot to one of the films I love most in the world has been wonderful, fun, and exciting. Thank you to Emma for letting us blow her lovely face open. Thank you to Dan for bravely shaving all his hair off - just to do this shoot! Thank you to Mike for patiently letting us glue rubber all over his face and chest. Thank you to Luna for tolerating my sick gory zombie eating requests. Thank you to James for performing well under heavy make-up, even though you had a major hangover. Thank you to Dashee for vital help with make-up. Most of all, thank you to my wife Claire for letting me stick a REAL machete in her head, and for generally tolerating and supporting the very weird guy she married. 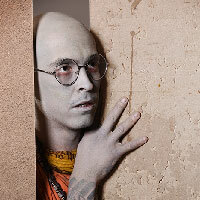 See the whole Dawn of the Dead zombie tribute shoot here.